It is up to you to insure that all local, state and federal laws are observed. You must make arrangements with your Local FFL Dealer before buying an FFL regulated item. The buyer must be able to pass a background check. We need a copy of your FFL dealer’s license before we can ship an order. 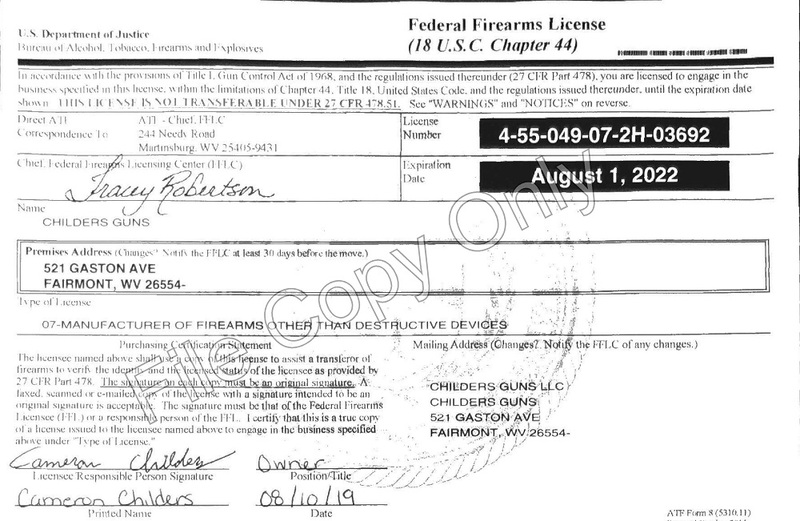 Email (or have your dealer email) a copy of the FFL license to: sales@childersguns.com. Make sure you include your order number and/or customer name IN THE SUBJECT OF THE EMAIL. Delivery Details – Enter the person's name your local dealer wants the package sent to (Many FFL dealers want your name on the shipment). Use the address and company name of your FFL dealer. When we have received and verified the FFL information, we will process and ship your order. You will be required to fill out the 4473 and any State paperwork to take possession of your item from your local FFL dealer. The dealer will charge a fee. Shipping charges for items to be serviced are for return shipping, from Childers Guns LLC back to the client.